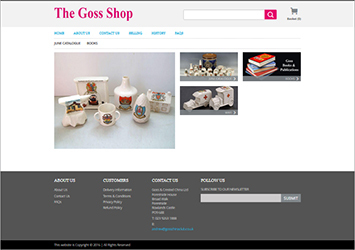 Goss & Crested China Ltd’s new online shop will be launching shortly where you will be able to buy Goss / crested china direct from the leading dealer online. We will be the first crested china dealer to publish our monthly catalogues primarily online with a facility for ordering and paying for china online without the need to contact us. Customers will also be able to return their purchased china for a full refund quickly and easily should they wish to do so, no reason necessary. If in the meantime you are looking for a particular piece of Goss Crested China or perhaps another brand of porcelain then please get in touch. We maybe able to help find that little piece for you with our years of experience and contacts world wide with other collectors. Simply follow the link below to our 'Request' page and fill out the form with details of what you are looking for. Alternatively you can always get in touch by email or phone where our full details can be found on the 'Contact' page. We can help you improve your collection. Please contact us if you wish to purchase an item from our catalogue or from the website. Please contact us with a brief description of your items or collection you wish to sell. Please contact us with a brief description of the items you wish to exchange. Please provide details and photographs of the item for valuation. Please note there is a small charge for this service (details on request).